One of the neat aspects of Wormhole Life, is the process of transitioning the wild and untamed NPC space, into a livable and profitable home for our pilots. This started right away, when we hauled in our ships, our POS (Player Owned Structure) and all the gun and maintenance arrays we wanted surrounding our home tower. However, building a safe place to store your ships and your loot, is just scratching the surface of it… We have a lucrative planet distribution in our slice of space heaven, so we wanted to maximize our Planetary Interaction (PI) right away. Fortunately our Production Director, T’ango, is a spreadsheet maniac and tackled the PI set-up and we got that buzzing fairly quickly. I am a cog in the machine and glad of it. In the midst of settling in, trucking in hundreds of thousands of m3 of cargo and supplies, killing the NPC denizens of our territory for multi-billion ISK loot payouts, harvesting pricy Gas clouds, and more ABC ore than we know what to do with, we have had to work on tearing down the NPC Customs Offices to replace them with our own, so that the multi-million ISK taxes we were paying to no one in particular, would cease. In the above photo, you see us blowing up our 5th or 6th CO, I forget which, but let me tell you, it is a tedious affair. The structure doesn’t move, nor does it fight back… It has 10,000,000 shields, and an additional about 5,000,000 armor and hull which means we spam volleys for a long time before we get the satisfying fire works. There are so many ins and outs to Wormhole Life. So much to do, so many risk and dangers and so much profit, just sitting waiting to be tapped by an industrial minded group of pilots, working together to forge a destiny of space wealth. Speaking of which, we got our first Corp Wormhole Dividend this weekend… basically we pool all of the wealth generated by the team, buy what we need, and distribute out the profit to everyone who was active during that pay period. It was healthy, but not massive, in large part because of the multi-billion ISK investments into infrastructure we have been making as we go. We see our stay as a long-term affair, so spending now to reap later, just makes sence to us. Things are getting underway, for INQ-E. Taking another look at EVE for the first time in a couple of years, I have to say the Planetary Interaction is the most interesting thing added while I was away. I have just set up a couple of crappy extract/factory worlds in high-sec producing superconductors and nanites, but it’s a neat new game mechanic for sure. Would be even neater producing materials for an actual purpose (as you are, fuelling your POS) than just doing it for some cash on the side, too. I sure did – the low low cost of Free as we make all of our own ammo in the WH and I’m not about to pay wages for any of the ore miners. Now the Faction Crystals Dex uses…. that we’ll chalk up to the simple fact that he likes big numbers. Cyndre – FYI but POS = Player Owned Station, not Structure. And thanks for making me internet-famous!! Pretty awesome! Sorry – I should have said ‘Free’. It’s free in all the logical sense of the word, given the other risks and costs associated with hauling ammo into the WH. Sure there might be better ways of getting isk which could have funded straight ammo purchases with some left over for something else, but those savings quickly dwarfed by the risks of traveling in W-space, Low Sec Space, Traveling time etc etc. I honestly, truly look forward to that post. NOT because I’m a Goon (though I have been one in the past), nor a troll, nor looking to bask in your suffering. But because a big part of Eve is finding that Next Big Thing that you are not prepared for and Learning That Lesson The Hard Way. Again, I want to make it clear that I’m not wishing that hardship upon you – I just know that it is very likely coming your way some day. Someone will scout your wormhole, bring their army, and knock down your toys. Circle of life, and all that. And when that happens, I am *really* looking forward to your write-up of the event. I’ve been enjoying your Eve blog posts (to me, it’s a much more fun game to read about than play), and I know how *I* reacted when my corp’s WH got scouted and steamrolled, but I am not half the writer you are. In the meantime, I wish you copious profits! Hopefully you can build up a heck of a war chest and bring the fight to whomever decides they want to take your little slice of heaven. I call that content! Bring it on! And of course I will write about it. FYI, I have lost 4 ships and been podded twice so far, so it isn’t all fun and games. So long as you still have the infrastructure, not all is lost. It was VERY difficult watching you guys shoot your first and second customs office and holding back on decloaking and attacking. Luckily, AAA tunneled into your wormhole and we found ourselves at a very interesting Mexican standoff. 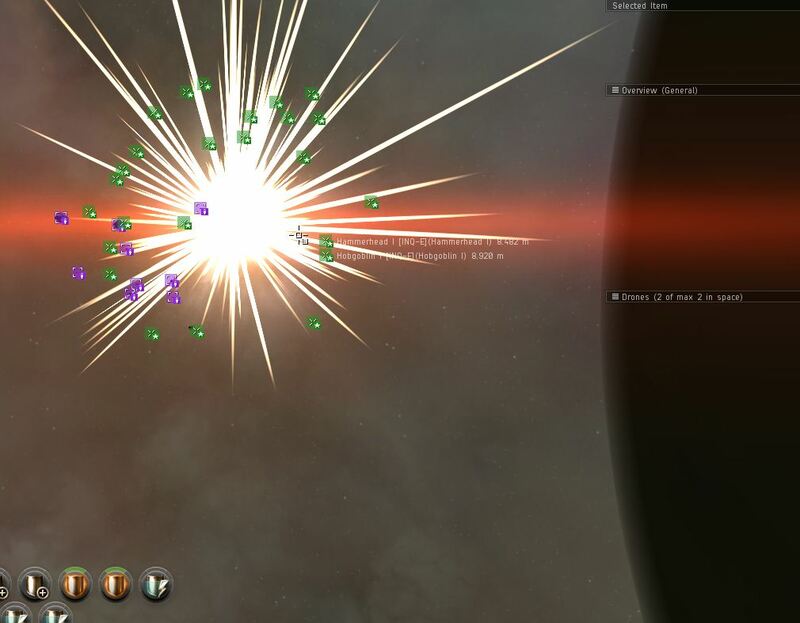 Hope you enjoyed the little wormhole roam from a few days ago, even though nothing came out of it.